From Time to Time during the growing season, we collaborate with fellow farmers, florists and local businesses to bring you an opportunity to dig in and get your hands dirty playing with flowers - and hopefully you’ll pick up a skill or two while you’re having fun! Description: Join Sarah Lutte of Lazy Acres Farm, and Andrea Ault of Honeysuckle Way Flowers, for an evening filled with flowers. We will begin with a tour of the flower farm, led by Sarah, during which we’ll spend some time harvesting your favorite blooms among the fields of flowers. Andrea will then teach us how to incorporate those flowers into beautiful, naturally styled arrangements. Each participant will create their own unique masterpiece to take home. Cost: $TBD including hors d’oeuvres, beer and wine, and all materials. Space is limited and we need at least 6 participants to hold the class. All experience levels welcome. Adults only please. Registration: Please contact us for registration information. Questions: Please contact us if you have any questions about the workshop. Description: Join Sarah Lutte of Lazy Acres Farm, and Rhea Butler of Alewives Fabrics for a fun filled morning of flowers and fabric. 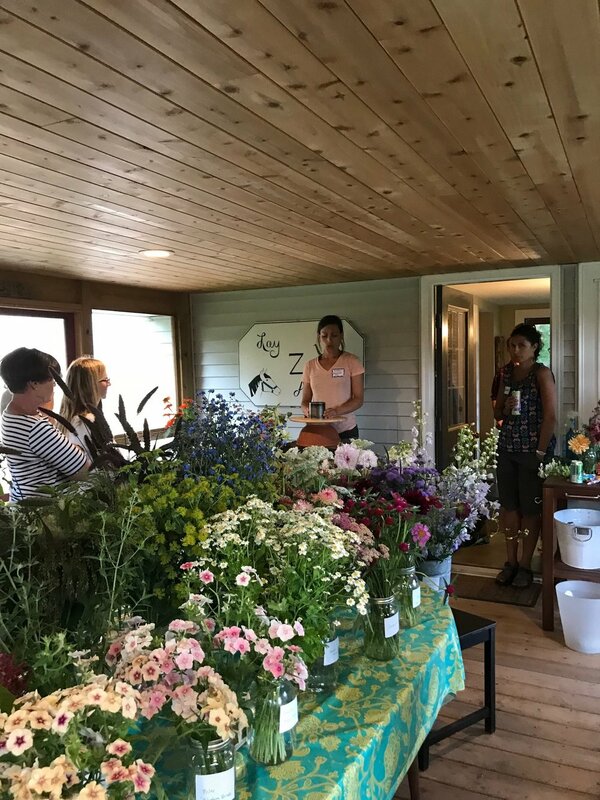 Spend your morning surrounded by the most fun, vivid, and colorful feast for the eyes in Alewives Fabric’s downstairs classroom as we play with flowers harvested from Lazy Acres Farm just up the road in Farmingdale. Bucket after bucket of farm fresh flowers will be available to you to play with as Sarah guides you through making your own unique natural arrangement to take home. When you’re finished, be sure to peruse the upstairs shop to fulfill all your sewing, fabric and yarn dreams. Cost: $TBD including snacks, non-alcoholic beverages and all materials. Space is limited and we need at least 6 participants to hold the class. All experience levels welcome.